Can we talk about what happened with the weather for a second? Overnight it went from beautiful summery weather to cool fall breezes leaving me scrambling to find my booties and fall coat (at least that’s what happened here in Milwaukee, WI). But more than the weather, there seems to have been a universal schedule shift, and that would be because of the infamous back-to-school schedule change. 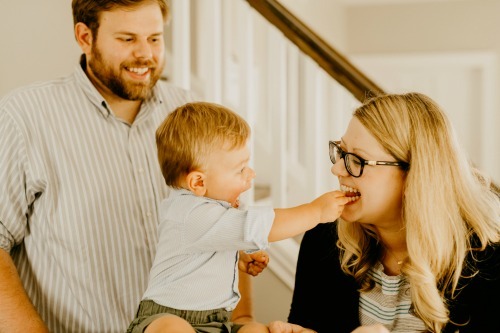 Many of my parent friends feel a sense of joy that they will have some extra time during the day, while others feel a combination of sadness and anxiety because of sending their children to school for the first time. But whatever the back-to-school feelings are, across the board, there seems to be a hustle and bustle of busy schedules, lack of time, and the dinner dilemma…the ‘what should I make for dinner that’s not going to take me away from my family for a million hours yet is something that everyone will love and is healthy for them.’ And even though I don’t have children yet, I definitely face the dinner dilemma amidst busy schedules all the time! All.The.Time! That’s where my favorite Wisconsin grocery store, #MyPicknSave , comes in and saves the day. They have a great fresh salad bar that has guacamole, pico de gallo and of course a whole grocery store of awesome ingredients that I can just swing by on my way home and pick up ingredients from. 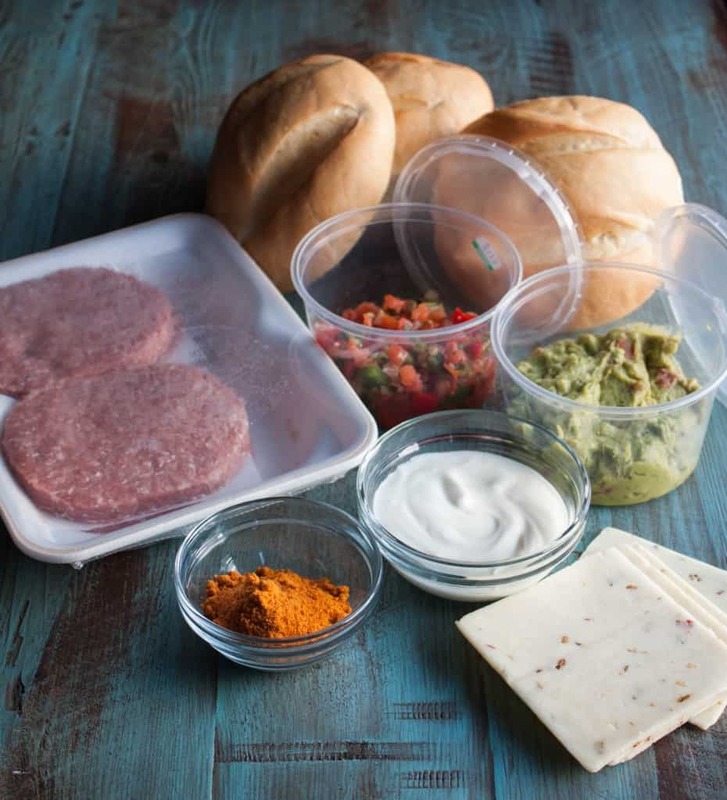 Keep a combination of healthy dry (pasta, rice, tortillas) and fresh (vegetables, lean meat, cheese) ingredients on hand. 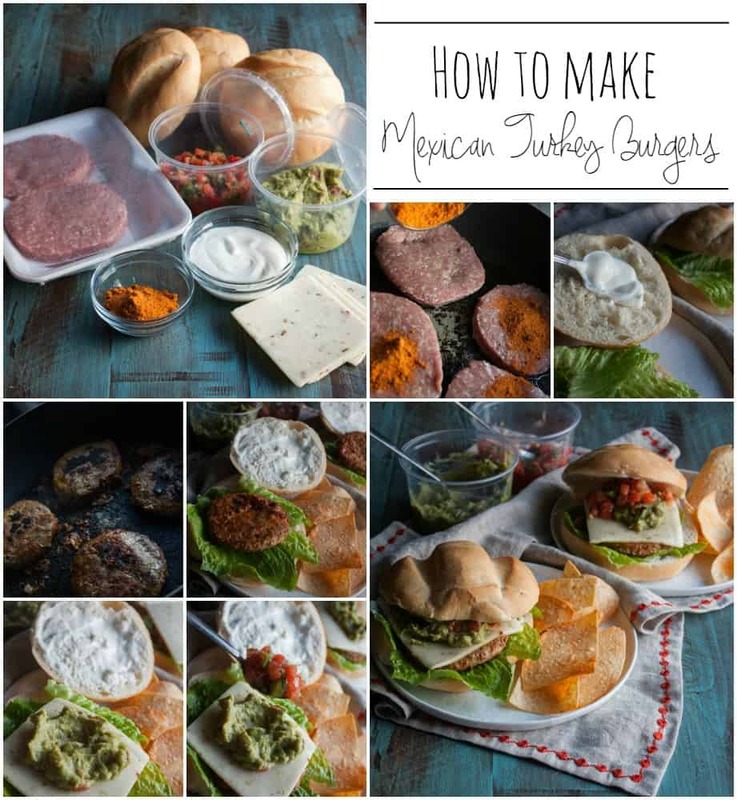 To make these lovely Mexican turkey burgers you’ll need ground turkey patties (you can buy them pre-formed) and then you’ll just sprinkle a packet of taco seasoning on them. While they’re cooking you can set up the plates with some chips & pico de gallo and the burger buns (put a piece of lettuce on the bottom bun, and then spread sour cream on the top bun) When the patties are done cooking (they only take about 7-10 minutes to cook) place one patty on the bottom bun on top of the lettuce, lay a slice of pepper jack cheese on top of the patty, spoon some pico de gallo on top, then spoon a little guacamole on, then place the top bun on and enjoy! I set a timer from when I got out my pan to when the meal was on the plate…want to know something? To get this meal on the plate, it takes only 12 plus minutes! 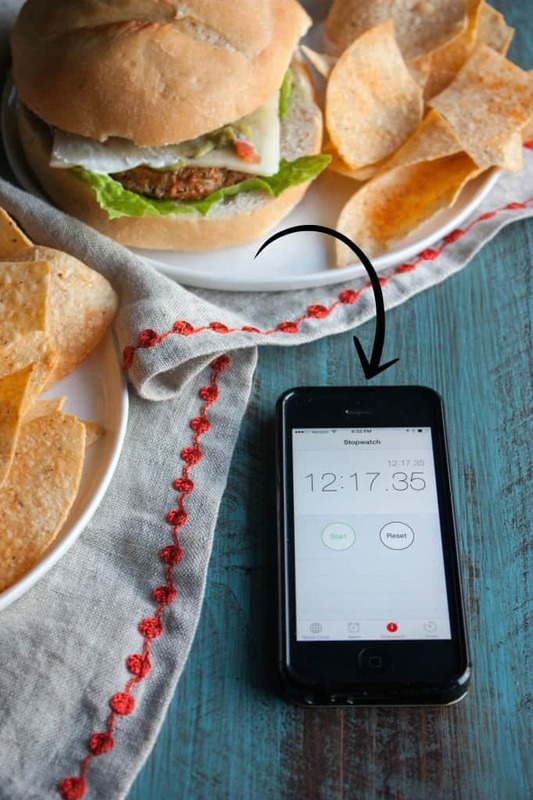 So there you have it, dinner in under 15 minutes!! In a nonstick pan put turkey patties, sprinkle about a teaspoon of taco seasoning on each. 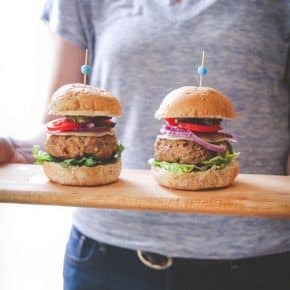 Cook for 5 minutes, flip, sprinkle another teaspoon of taco seasoning on each turkey burger patty, cook for another 5-6 minutes until cooked through (you can cut one burger in half to make sure that there is no more pink. 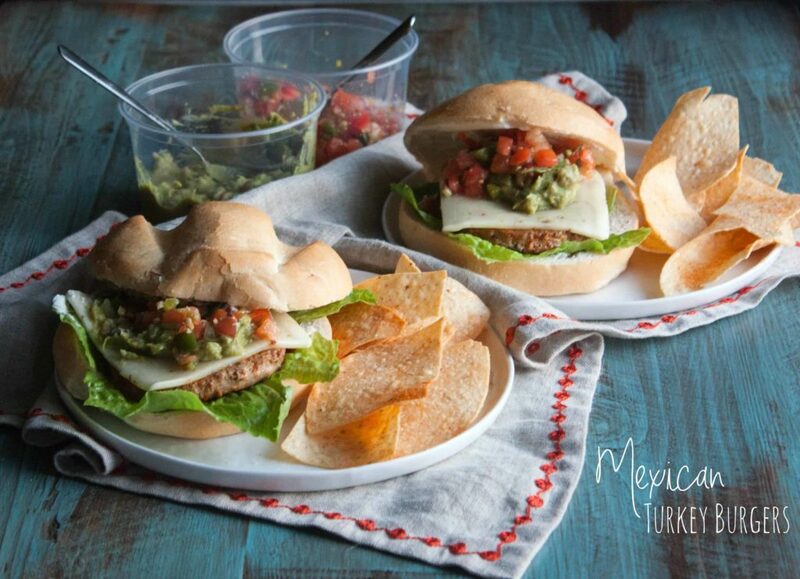 While turkey burgers are cooking, set out plates and add a handful of tortilla chips on each plate. 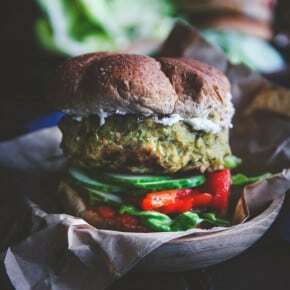 Place a bun on each plate, and then cut each bolillo roll or burger bun in half and lay lettuce leaves on the bottom bun and spread about one tablespoon of sour cream on the top burger bun. 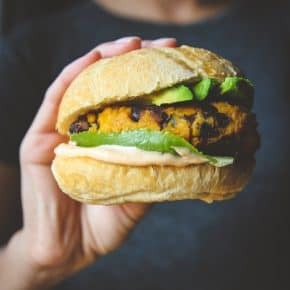 When turkey burgers are done cooking place patty on the lettuce, then place a piece of pepper jack cheese on top, then spoon a few spoonfuls of guacamole and pico on top, place top burger bun on top and then enjoy! Awe, thank you so much for your lovely comment Summer! 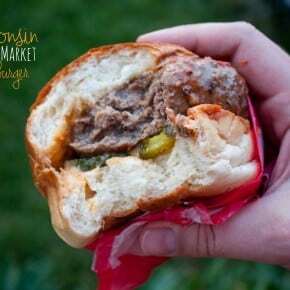 Great flavour combo to add a little somethin something to the burgers! Mexican-inspired anything is a winner in my books! And yes please to quick dinners! It’s the board!!! And it looks WONDEROUS! Girl, love these photos and I am wondering: do you ship? I need these burgers NOW. Pinned!